— House is clean after…a long time. It feels good. I was tempted to move into a hotel for the night just to make my hard work last more than 4 hours. Didn’t happen and right now there is a dirty footprint on my freshly mopped floors. Such is life! –I’ve spent way too many hours thinking about this ESL celebration. I want it to go so well for Tomas. I know there are many deep seeded crazy reasons why I’m making such a big deal about this but I assure you they are all rooted in my deep love of this boy. And a deep love for the country that produced 3 of my sons. I get that the country itself can’t see my tribute to it, and I also get that the special people in the country can’t see how hard I’m trying to honor their sacrifice, but for some reason that hasn’t stopped me from trying as hard as I can to do it anyway. –I bought some injera from an Ethiopian man who lives about 45 minutes away. I asked him if he’d make us dinner for tonight too (I obviously paid him) since I was driving all of that way. Tomas cried when he saw the injera. 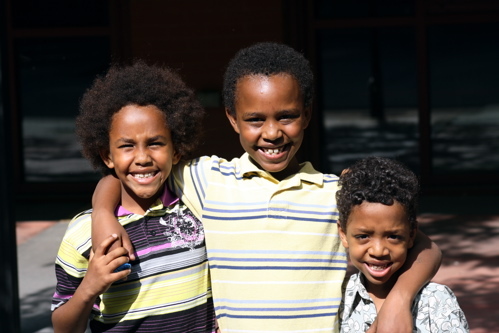 And then he hugged Dawit and told him he was the best cooker ever. The Ethiopian food tasted so good. I felt totally ashamed at how bad I’ve been at making/buying this connection to their culture. Shame on me, seriously. –Went to the pool tonight. Summer is almost here. June 3rd is our last day of school. I’m wanting the kids home with me now. They are so much fun. I miss them. Ready to see more of them. Stay tuned for these 3 boys tomorrow. There will be pictures of them in their traditional Ethiopian garb and, probably, pictures of masses of girls (and some boys) throwing themselves at my adorable sons. And how could they not?